Putting my preserved lemons to good use. So, here’s the recipe I promised for using the Preserved Lemons. 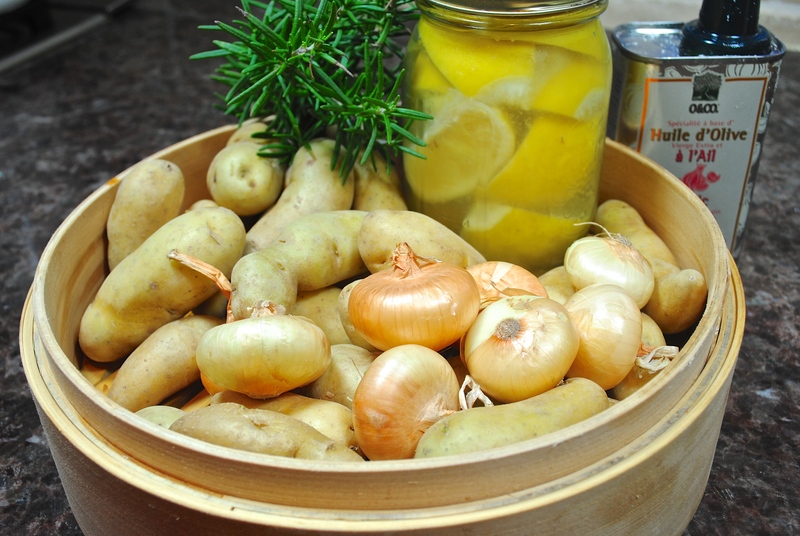 I have been looking for something to use my preserved lemons with since I made them back before Christmas. This year our Myer Lemon tree produced about 18 lemons or that’s what was left after squirrels or some other critter pulled some off, nibbled a little on the green, unripened lemons and left them before going on to destroy something else. I have to say, opening up a Bon Appetit magazine, that I did not order, and seeing this potato dish with PRESERVED LEMONS excited me. 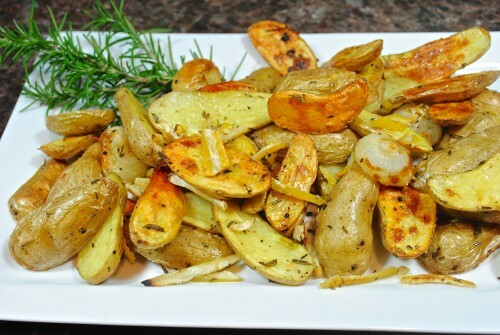 Ok, it’s just potatoes but now I can use my lemons. About the magazine — I was curious why I got the magazine as I haven’t taken this one for at least 15 years and didn’t want to be charged later for some type of renewal. Long story short is I ordered something at Christmas from a company that gave me a free year’s subscription. So, guess I will enjoy it until next year and maybe I will decide to renew it. The preserved lemons were so easy to make. If you find lemons on sale sometime try making a couple of jars. They are as simple as cutting in quarters, packing with salt, putting in jars and just keep pushing them down until they make juice. You may have to add a little juice to top off the jar but that’s it. Refrigerate them for a few weeks and they are ready to go. I have read to use them in risottos, salad dressings and salads; and I’m sure there are lots of other recipes out there using them. Oh, and you only use the rind when you get ready to put them in a dish, throw away the lemon pulp, seeds, etc and chop or sliver up the lemon rinds. I added some cipollini onions because I think they are so cute. And the “cute” factor always sells me on a vegetable. And the best thing of all about these lemons is that I beat the squirrels to them this year. 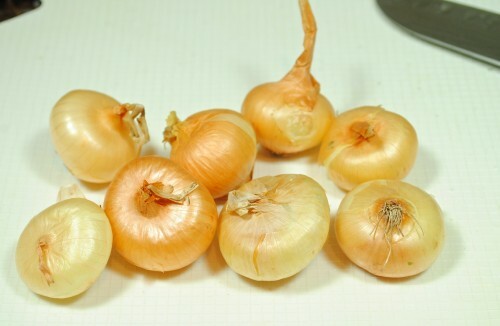 I love those little cipollini onions. 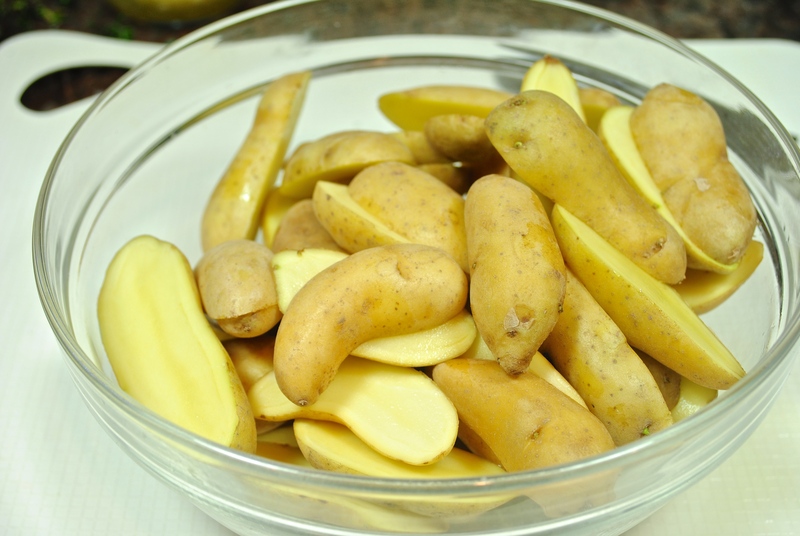 I cut my potatoes in advanced and covered with water to prevent them from turning brown. You want to pull out the lemon flesh from the inside and only use the rind. 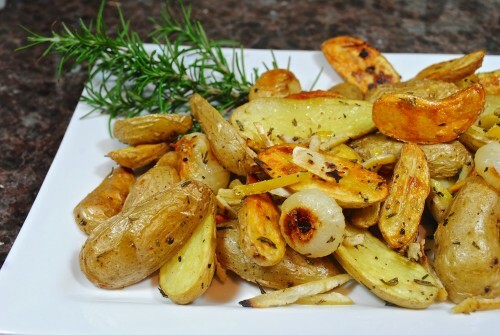 Roast until almost brown and then add in the slivered lemon peel. The recipe says to do it after removing from the oven but I wanted the peel to get warm and mix better with the potatoes. Delicious. You won’t believe how good the lemon taste alongside these potatoes. *Notes from BA was to replace half the potatoes with pieces of chopped carrots and toss with melted butter and Aleppo pepper. 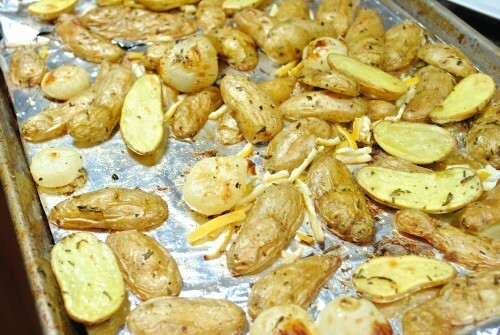 Another way was to sprinkle fresh or dried oregano over potatoes before roasting and them top with feta to serve. These sound interesting to me also. And, a fourth way they suggested (I’m not crazy for curry) was to season potatoes with curry powder before roasting and sprinkle with coarsely chopped cashews and cilantro to serve. Hey Sherry, I want to make the preserved lemons. You said pack with salt. What exactly does that mean? How much salt? I roast fingerling potatoes all the time and this sounds yummy. donna, I will go back and add some videos that I looked at and change some of the notes. you put about 1/2-3/4″ salt first into each jar. Cut your lemons in 1/4 the, but not all the way through(one way of making these) then open up with your fingers and pack with salt or fill up as much as you can and then put in jar and squish down. OR one of my jars I cut lemons in half and dipped and coated each on with the salt before putting in jars. 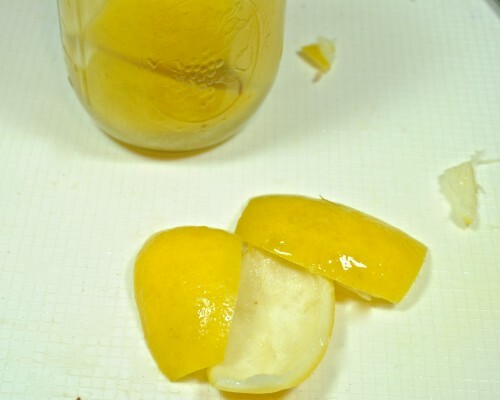 If you continue to press down as you add lemons you will almost have enough lemon juice to cover all the lemons then you can top off jars with extra squeezed lemon juice. Hope this answers your questions. And I will put some lines on showing what others did. I just used these lemons with some fish and some roasted chicken and added some to some brown rice I cooked the other day.